1. Make pate a choux cream puffs. Preheat oven to 400 dg F / 204 dg C. Line baking sheets with parchment paper. In a large saucepan, slowly bring the milk, water, butter, sugar, and salt to a simmer over medium-low heat. Remove from the heat, and add the flour all at once. Stir with a wooden spoon until combined and evenly moistened. Return the pan to medium-low heat and stir continuously for 3-4 minutes to dry out the mixture. Dough should pull away from side of the pan and skin should form on the base. Transfer dough to a standing mixer bowl and spread along the sides to speed up cool down time. Let sit for 10-15 minutes or until cool. Attach a paddle mixture, and adding 2 eggs at a time, mix on low speed until welL incorporated. Repeat process until all eggs are incorporated, and the dough is smooth and elastic. Add the dough to a piping bag fitting with a large star tip. Pipe dough onto baking sheets creating cream puffs. Place pans in the oven, and immediately turn down the heat to 350 dg F / 176 dg C. Bake for 35-45 minutes, rotating halfway through. In the last 10minutes, place a wooden spoon in the door jam to release some moisture. Once done, remove and let cool on pan until ready to use. 2. Make pastry cream. First, slit the vanilla pods open lengthways and scrape out the seeds. Put both pod and seeds into a heavy-based saucepan with the milk and bring slowly just to the boil, to infuse the vanilla. Meanwhile, place the egg yolks and sugar in a bowl and mix together for a few seconds, then sift in the flour and mix again. Pour the just boiling milk over the yolk mixture, continuously whisking to prevent curdling, then return the mixture to the saucepan. Add the salt then cook over a medium heat, whisking constantly for about 5-10 minutes, until very thick. Pass through a fine sieve over a medium bowl, discarding the vanilla, and place a sheet of plastic wrap on the surface of the custard to prevent a skin forming. Leave to cool, then refrigerate. 3. Make butterscotch sauce! Melt butter in a medium heavy-bottomed saucepan over medium heat. Add the sugar, cream. scotch and salt and whisk until well blended. Bring to a very gentle boil and cook for about five minutes, whisking occasionally. Remove from heat and add the vanilla extract, stirring to combine. Set aside to cool. 4. Make cookie dough. Preheat oven to 180 dg C, line a baking sheet with baking paper. Mix oats and icing sugar, spread evenly on baking sheet. Toast for 12-14 minutes, stirring ever few minutes until they are golden brown. Remove and let cool. Cut butter into small pieces and place all ingredients in a mixer with paddle attachment and blend until a ball forms. Place in refrigerator for at least 1 hour. When ready, roll out dough into 8x8, 6x6, and 4x4 squares and bake in a 140 dg C oven for 15 minutes. Remove from oven and let cool on pan for 5 minutes, then move to cooling rack. 5. Make shiny chocolate glaze. Put chopped chocolate into a medium bowl. Bring the simple syrup to a boil over medium-high heart. Slowly whisk in the cocoa powder and espresso powder until dissolved. Bring mixture back to a boil. Slowly pour in the simple syrup to the bowl of chocolate and hazelnut extract, only a few tablespoons at a time. Mix together the melting chocolate with the syrup, then add more in, repeat until you have all of the simple syrup in the chocolate and it is smooth and shiny. Let the chocolate glaze rest to the side until room temperature. 6. Fill and ice cream puffs. Using a pastry bag and tip (or squeeze bottle), fill cream puffs with vanilla pastry cream through the sides. 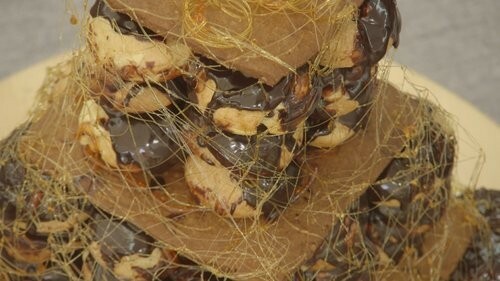 Take filled puff and dip in the shiny chocolate glaze or caramel, and place on a cooling rack to set. 7. Make buttercream. Cream room temperature butter until smooth and fluffy. Gradually beat in icing sugar until fully incorporated. Beat in vanilla extract. Pour in milk and beat for an additional 3-4 minutes. Add in food coloring. 8. 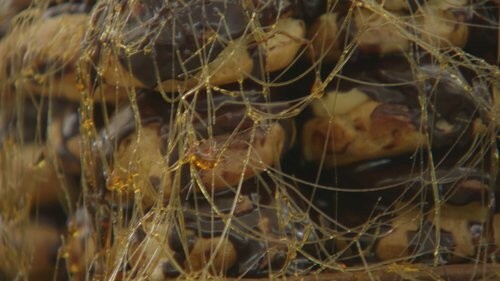 Make caramel ribbons. Combine all ingredients in a pan and bring to a boil over medium heat and stir occasionally. The caramel should be removed once it reaches a light amber color. 9. Assemble structure. Stack the cream puffs side by side until a base is created. Place a layer short crust on top, and repeat process until the “present” is done. Place sugar ribbon on top.